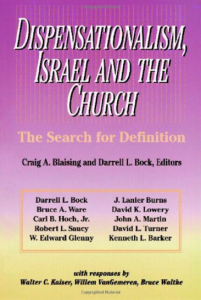 Author: Blaising, Craig, Bock, Darrell L.
This 1992 book is written by Blaising and Bock (both professors at Dallas Seminary) and nine other contributors, mostly from historically dispensational seminaries. The arguments are generally that Jesus is sitting on David’s throne now in heaven so that the kingdom has, in a way, begun; Israel and the Church share equally in the New Covenant; the new man of Ephesians 2 is a new people of God into which both Israel and the Church enter; the mystery of Ephesians is God’s historical salvation program; some Old Testament prophecies do foresee the Church and the Church does typically fulfill many prophecies in an ‘‘already/not yet’’ way. The New Testament is used to interpret the Old in a more free way and the Church is seen less as a ‘‘time-out’’ or ‘‘parenthesis’’ and more as a necessary cog in the redemptive plan for Israel.